The entire British Royal family are well known public figures and are open to the public. The family gathers the attention no matter where they are. Even the to be born Royal kid, the third child of Kate and Williams is making the news. Everyone for sure will be excited to know and learn much more about the Royal family and if you are also one, then this special article on Royal family with stuff like the royal family tree, the royal traditions, line of succession, rules that England Royals abide by will be interesting for you to go through. So, go through them and get to know more about the Royals, their traditions, their rules and all. 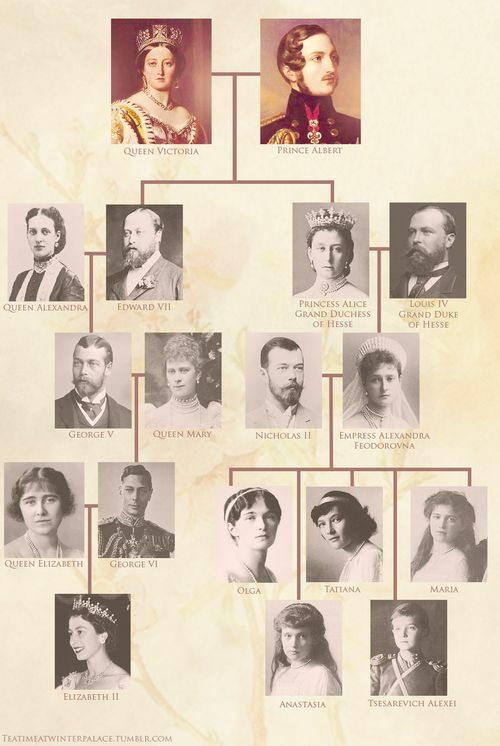 Being born in a Royal family is just a bliss and catch up all the blissful people of this England Royal family here as we are presenting you the Royal family tree here. House of Windsor is the currently ruling Royal family in England and the family that is on the throne now. So, let us look at the family tree of House Of Windsor, it, in fact, began with King George V, but considering the current throne owning and living Royals, let us begin with Queen Elizabeth II. So, when we start with Queen Elizabeth II and King Philip, The Duke Of Edinburg. They have got four children Charles, Anne, Andrew, Edward. Prince Charles married Princess Diana, the Princess of Wales. Princess Anne married Prince Mark Philips. Prince Andrew married Sarah, the Duchess Of York. Edward married Sophie, Countess Of Wessex. Charles and Diana have had two children together Prince Williams and Prince Harry. Anne and Mark Philips have had two children together Peter Philips and Zara Tindall. Sarah and Andrew also have got two children Beatrice, and Eugenie. Edward and Sophie too got two children Louise and James. Prince William got married to Kate, the Duchess of Cambridge and had two children George and Charlotte. Kate is now pregnant with their third child expected to be born in April 2018. Prince Harry got engaged to Meghan Markel, who is non-Royal and is an American actress. Peter Philips married Autumn and have had two children with her Savannah, Isla. Zara married Mike and had a child Mia Grace. This Royal family is the House of Windsor. Windsor remains as the current family name of the current British Royal family. The British royal family got this name replacing the earlier family name House of Saxe-Coburg-Gotha. Take a look at the House Of Windsor family tree. 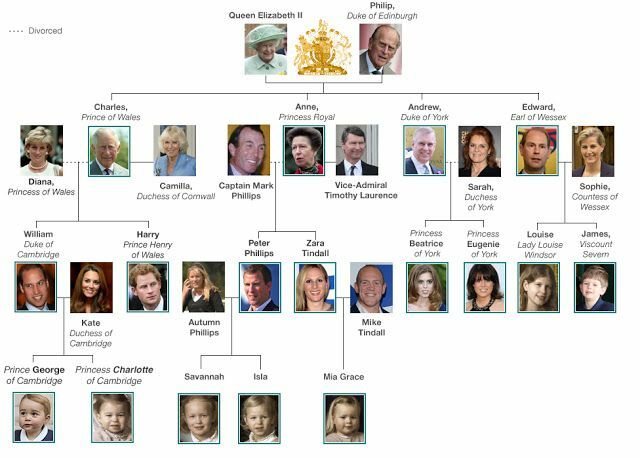 This is the Royal family tree of the current British Royals and many of them are very much popular and well known to us but most of the media’s attention is attracted by the next in line of the throne members who are the descendants of Princess Diana. Especially Prince Williams family is very popular with us and George and Charlotte are among the most popular Royal kids in the world. As of now the first person in the line of succession to the Royal throne is Prince Of Wales, the Queen’s eldest son. Next in throne is Prince William who is the eldest son of Prince of Wales and Princess Diana. Next person who is in the line of succession is Prince George, the eldest kid of Prince William and Kate Williams. Then comes his younger sister Princess Charlotte. Next to her will be the to be born third child of Prince Williams and Kate. Then comes in line Prince Harry, the second son of Princess Diana and Prine Of Wales. Queen Elizabeth II, present sovereign of the Commonwealth realms, is the daughter of King George VI, the second son of King George V and Queen Mary; and of Lady Elizabeth Bowes-Lyon (later Queen Elizabeth, and, after her daughter’s accession to the throne, the Queen Mother), the daughter of Claude Bowes-Lyon, 14th Earl of Strathmore and Kinghorne, and his wife, Cecilia Bowes-Lyon, Countess of Strathmore and Kinghorne. We hope this picture of the royal family tree Queen Victoria helped in understanding the queen’s family and when we think of the relation between Victoria and Queen Elizabeth II, she is the daughter of Queen Victoria’s great-granddaughter. 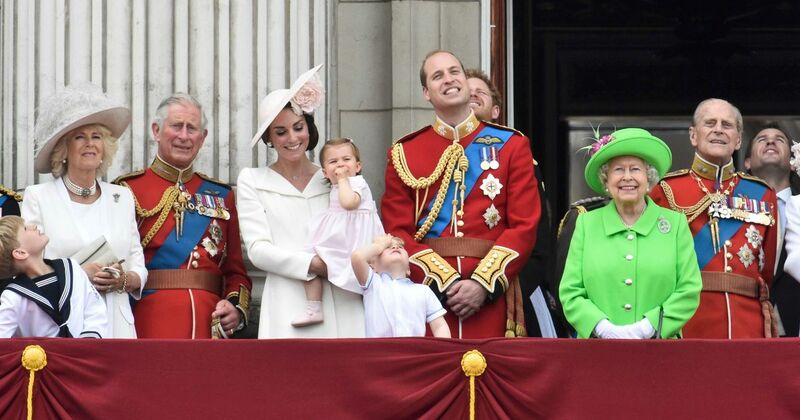 The England Royal family is probably the world’s most watched family and they have got many strict rules that they should abide by which may amaze you. So, here we are presenting you with some of the rules that they strictly follow. It will be weird to know but the Royal descendants actually require permission from the Monarch (the Queen Elizabeth II as of now) before proposing according to the Royal Marriages Act. The members of the Royal family were restricted from having political views that means they just cannot vote, or at least speak about politics. Another saddest thing about being a Royal family member is that they cannot play Monopoly. The members of the royal family cannot even sign autographs or pose for selfies. Two Royal heirs are not allowed to fly together. Since George is a kid now, he can travel with his father now, but once he turns 12, he and his father Williams cannot fly together. The Queen is the only person in England who can drive a car without having a driver’s license and a plate. We hope this article helped you in learning a bit about the Royal family and the Royals who are next in line to the throne and also a few rules that the members of the royal family abide by.